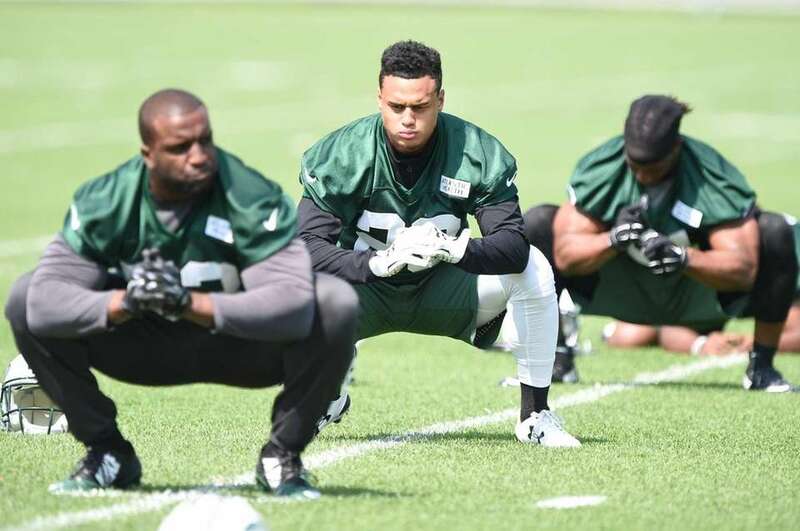 Scenes from the New York Jets' OTAs in Florham Park, N.J., heading into the 2016 season. Jets receiver Brandon Marshall catches a pass during the Jets' OTAs on Wednesday, June 1, 2016 in Florham Park, N.J. Jets quarterback Bryce Petty talks with a receiver during the Jets' OTAs on Wednesday, June 1, 2016 in Florham Park, N.J. Jets quarterback Bryce Petty attempts a pass during the Jets' OTAs on Wednesday, June 1, 2016 in Florham Park, N.J.
Brandon Marshall of the Jets addresses the media during the Jets' OTAs on Wednesday, June 1, 2016 in Florham Park, N.J. Jets head coach Todd Bowles addresses the media during the Jets' OTAs on Wednesday, June 1, 2016 in Florham Park, N.J.
Nick Mangold of the Jets during the Jets' OTAs on Wednesday, June 1, 2016 in Florham Park, N.J. Jets receivers Eric Decker and Brandon Marshall on the field during the Jets' OTAs on Wednesday, June 1, 2016 in Florham Park, N.J.
Erin Henderson (#58) of the Jets works against Charone Peake (#17) during the Jets' OTAs on Wednesday, June 1, 2016 in Florham Park, N.J. Jets quarterback Geno Smith attempts a pass during the Jets' OTAs on Wednesday, June 1, 2016 in Florham Park, N.J. Jets quarterback Christian Hackenberg hands off to running back Romar Morris during the Jets' OTAs on Wednesday, June 1, 2016 in Florham Park, N.J. Jets quarterback Christian Hackenberg hands off to running back Matt Forte during the Jets' OTAs on Wednesday, June 1, 2016 in Florham Park, N.J.
Erin Henderson (#58) of the Jets on the field during the Jets' OTAs on Wednesday, June 1, 2016 in Florham Park, N.J.
Erin Henderson (#58) of the Jets works against Julian Howsare (#43) during the Jets' OTAs on Wednesday, June 1, 2016 in Florham Park, N.J. Jets receiver Brandon Marshall calls for the ball during the Jets' OTAs on Wednesday, June 1, 2016 in Florham Park, N.J. Jets quarterback Christian Hackenberg attempts a pass during the Jets' OTAs on Wednesday, June 1, 2016 in Florham Park, N.J. Jets receiver Eric Decker talks with head coach Todd Bowles during the Jets' OTAs on Wednesday, June 1, 2016 in Florham Park, N.J.
Quarterback Geno Smith and Jets receiver Brandon Marshall high five during the Jets' OTAs on Wednesday, June 1, 2016 in Florham Park, N.J. 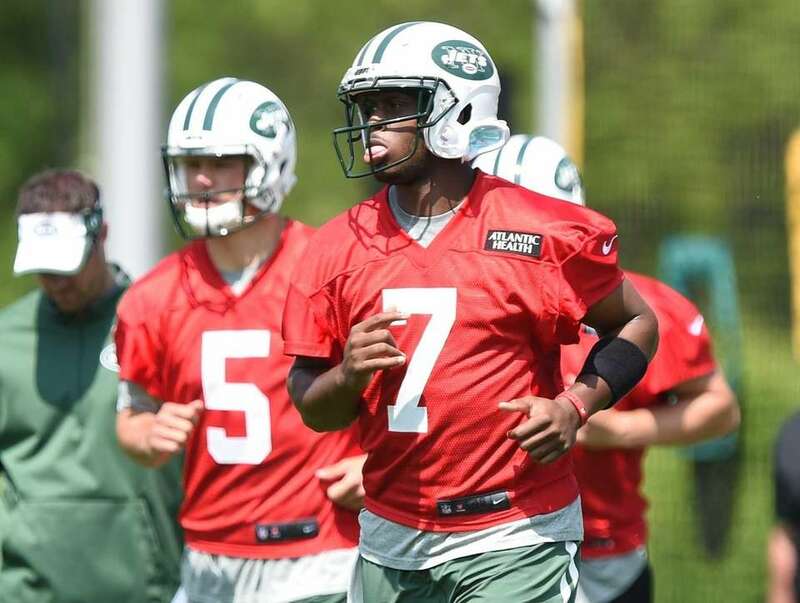 Jets quarterback Geno Smith during the Jets' OTAs on Wednesday, June 1, 2016 in Florham Park, N.J. 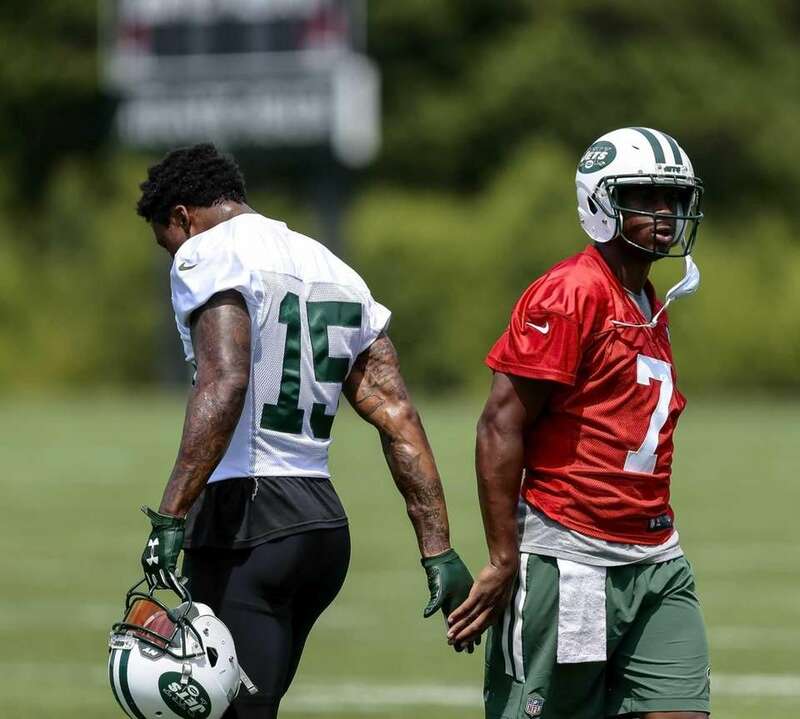 Jets receiver Brandon Marshall gives advice to another receiver during the Jets' OTAs on Wednesday, June 1, 2016 in Florham Park, N.J.
New York Jets quarterbacks Christian Hackenberg, Geno Smith and Bryce Petty are seen during Organized Team Activities at the Jets Training Center on Wednesday, May 25, 2016. New York Jets head coach Todd Bowles answers questions from the media during Organized Team Activities at the Jets Training Center on Wednesday, May 25, 2016. 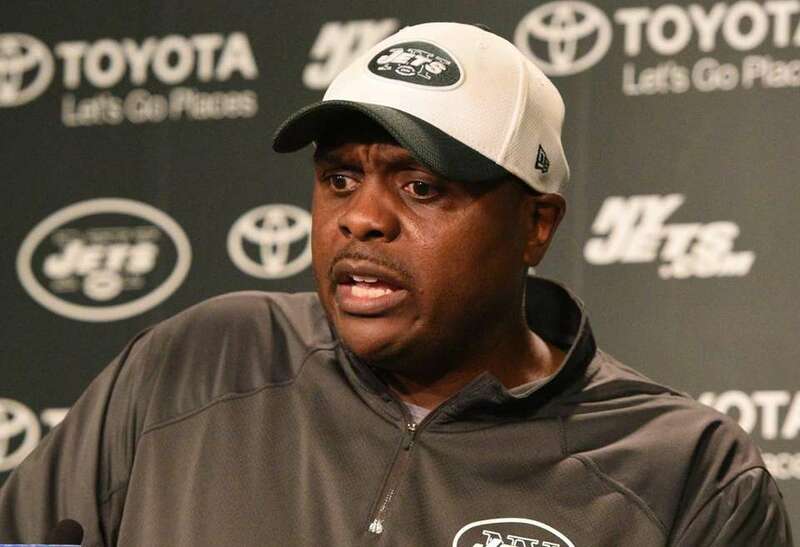 Jets defensive coordinator Kacy Rodgers answers questions from the media during OTAs at the Jets Training Center on May 25, 2016. 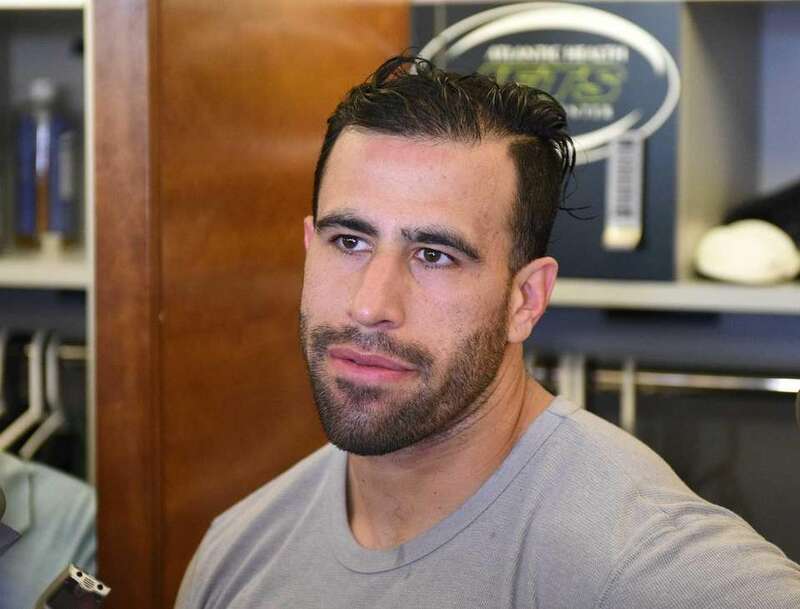 New York Jets tight end Jace Amaro answers questions from the media during Organized Team Activities at the Jets Training Center on Wednesday, May 25, 2016. New York Jets defensive end Sheldon Richardson answers questions from the media during Organized Team Activities at the Jets Training Center on Wednesday, May 25, 2016. New York Jets quarterback Geno Smith heads to another section of the field during Organized Team Activities at the Jets Training Center on Wednesday, May 25, 2016. New York Jets cornerback Marcus Williams stretches during warmup at Organized Team Activities at the Jets Training Center on Wednesday, May 25, 2016. New York Jets quarterback Christian Hackenberg answers questions from the media during Organized Team Activities at the Jets Training Center on Wednesday, May 25, 2016. New York Jets quarterback Christian Hackenberg hands the ball off to Jets running back Dominique Williams during Organized Team Activities at the Jets Training Center on Wednesday, May 25, 2016. New York Jets running back Matt Forte runs with the football during Organized Team Activities at the Jets Training Center on Wednesday, May 25, 2016. New York Jets tight end Jason Vander Laan, center, and teammates look on during Organized Team Activities at the Jets Training Center on Wednesday, May 25, 2016. New York Jets cornerback Dexter McDougle stretches during warmups at Organized Team Activities at the Jets Training Center on Wednesday, May 25, 2016. New York Jets kicker Nick Folk participates in drills during Organized Team Activities at the Jets Training Center on Wednesday, May 25, 2016. New York Jets punter Lachlan Edwards, left, and punter Tom Hackett look on during Organized Team Activities at the Jets Training Center on Wednesday, May 25, 2016. New York Jets linebacker Jordan Jenkins, right, and teammates run drills during Organized Team Activities at the Jets Training Center on Wednesday, May 25, 2016. New York Jets head coach Todd Bowles observes his players during Organized Team Activities at the Jets Training Center on Wednesday, May 25, 2016. New York Jets cornerback Marcus Gilchrist stretches during warmups at Organized Team Activities at the Jets Training Center on Wednesday, May 25, 2016. New York Jets quarterback Geno Smith is seen during Organized Team Activities at the Jets Training Center on Wednesday, May 25, 2016. New York Jets players participate in drills during Organized Team Activities at the Jets Training Center on Wednesday, May 25, 2016. New York Jets safety Ronald Martin stretches during warmups at Organized Team Activities at the Jets Training Center on Wednesday, May 25, 2016. New York Jets quarterback Geno Smith talks with Jets guard Brian Winters during Organized Team Activities at the Jets Training Center on Wednesday, May 25, 2016. New York Jets quarterback Geno Smith catches a snap during Organized Team Activities at the Jets Training Center on Wednesday, May 25, 2016. New York Jets quarterbacks Christian Hackenberg and Geno Smith look on during Organized Team Activities at the Jets Training Center on Wednesday, May 25, 2016. New York Jets quarterback Geno Smith answers questions from the media during Organized Team Activities at the Jets Training Center on Wednesday, May 25, 2016.
during Organized Team Activities at the Jets Training Center on Wednesday, May 25, 2016. New York Jets quarterback Geno Smith hands the football off to Jets running back Romar Morris during Organized Team Activities at the Jets Training Center on Wednesday, May 25, 2016. Vote: How many games will the Jets win in 2017?